Registration is now open for the programme. Students and staff members are invited to donate book (new and used) and register their names for the programme in the library on or before 25 January 2019. The students of Kendriya Vidyalaya Pattom gifted books to the students of Govt Model Upper Primary School, Kumarapuram under a social responsibility initiative “Gift a Book and Get a Friend”, here today. Shri S. Ajayakumar, Principal, KV Pattom, inaugurated the programme by handing over a set of books for the school library to Smt T. Sudharma, Senior Teacher, Govt. Model UPS Kumarapuram. Shri A. K. John, President, Parent Teachers’ Association presided over the function. 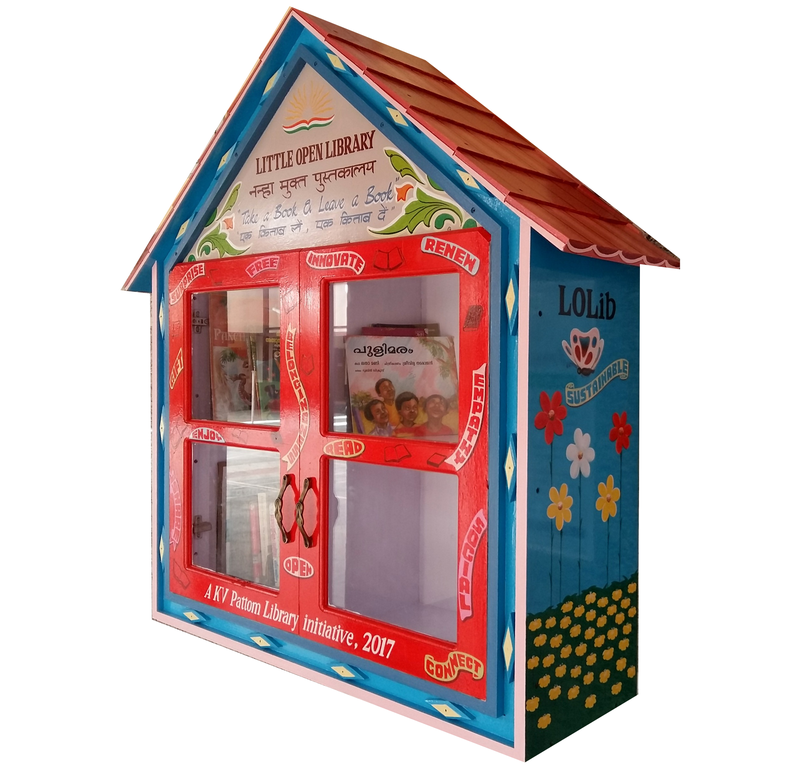 ‘Gift a Book and Get a Friend’ is a collaborative social responsibility programme conceived under school’s social responsibility initiative, “Library-Social Connect”, launched in 2013. The title itself effectively summarizes why this initiative is being followed. Rather than giving a financial contribution or donation, the school plans a long-term relationship by forging friendships through the mutual love for books. 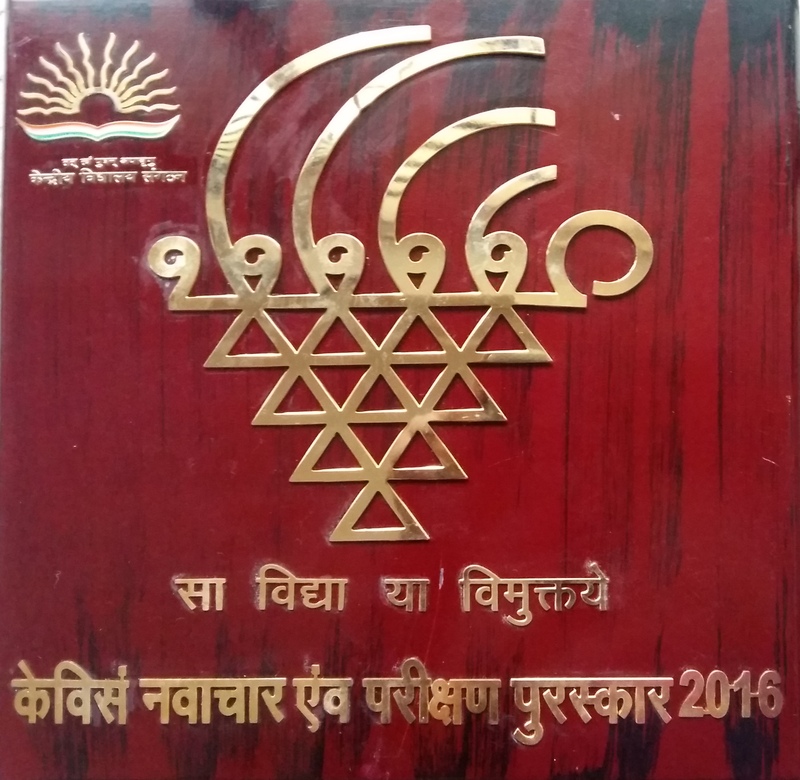 In addition to helping children in schools that lack a well-stocked library to get access to the world of literature, the programme also sensitizes the Readers’ Club members to social reality beyond the school walls. The first edition of the programme was held at Government Upper Primary School, Palkulangara on December 6, 2013. The programme is being organized every academic year with a new school. The schools so far covered are Government Upper Primary School, Ulloor (2014), Government Lower Primary School Pettah (2016), and Government High School Mannanthala (2017). More than 500 good quality new and used Malayalam and English books were collected form students and staff of Kendriya Vidyalaya Pattom. All students of the partnering school were presented with book packets and which also contains gifts like note books, sweets, writing materials, cards and toys. 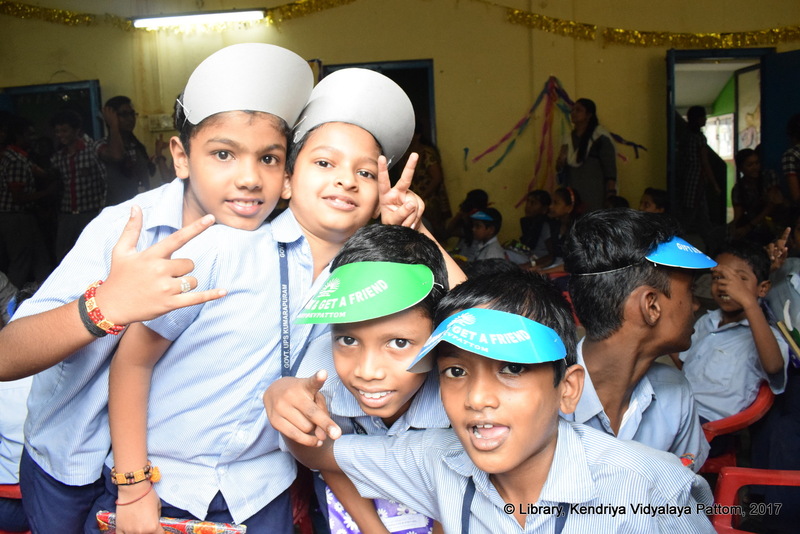 To add colour to the occasion, the members of the Readers’ Club of KV Pattom and UPS Kumarapuram jointly presented a cultural session which includes presentation of songs, book reviews, poems, skits, quizzes and games. There was free and open interaction through mutual sharing of experiences that has helped the students of both schools to become more confident in confronting the social realities and develop compassion towards the needy. The connections made with the partnering school through the programme will be kept intact for future through more collaborative initiatives such as sharing of resources, teacher exchange programmes and redesigning or resource development of the school library. Mr S. L. Faisal, KV Pattom Librarian & Coordinator proposed vote of thanks. The students of Kendriya Vidyalaya Pattom gifted books to the children of Govt L.P.S. Pettah under a library social initiative programme “Gift a Book and Get a Friend”, here today. Shri S. Ajayakumar, Principal, KV Pattom, inaugurated the programme by handing over a set of books for the school library to Shri Kishore Kumar, Head Master, Govt. L. P.S. Petah. Shri Anil Kumar, Pettah Ward Councilor, Trivandrum Corporation and Shri Radhakrishnan, Programme Officer, Urban Resource Centre, Sarva Shiksha Abhiyan offered felicitations. The students of KV Pattom gifted about 450 books to 50 children of the host school who were coming from less privileged sectors of the society. They were also presented with sweets, writing materials, cards and toys. The members of the Readers’ Club then presented songs, dance, Quiz and poems to add colour to the occasion. The students together visited different corners of the school and interacted with teachers and other staff. “Gift a Book and Get a Friend” is conceived as a ‘Library-Social Connect’ initiative to provide students with better opportunities to know about the society at large and other learning systems in particular and to make friendship through reading and books. The programme was organized in Govt LPS Palkulangara and Govt. LPS Ulloor in previous years. Mr S. L. Faisal, KV Pattom Librarian & Coordinator proposed vote of thanks. The 3rd edition of the poplar social responsibility initiative of KV Pattom Library “Gift a Book & Get a Friend” will be held at Govt. L. P. S. Pettah, Thiruvananthapram on 18 January 2016. The students of KV Pattom will gift books to the students of Govt L. P. S. Pettah and spent a few hours with them. Rather than giving a financial contribution or donation, KV, Pattom, plans a long-term relationship by forging friendships through the mutual love for books. Kendriya Vidyalaya, Pattom, has built a vibrant reading culture among its students over the past few years and now the school is keen on spreading the same enthusiasm among schools that are not as privileged. 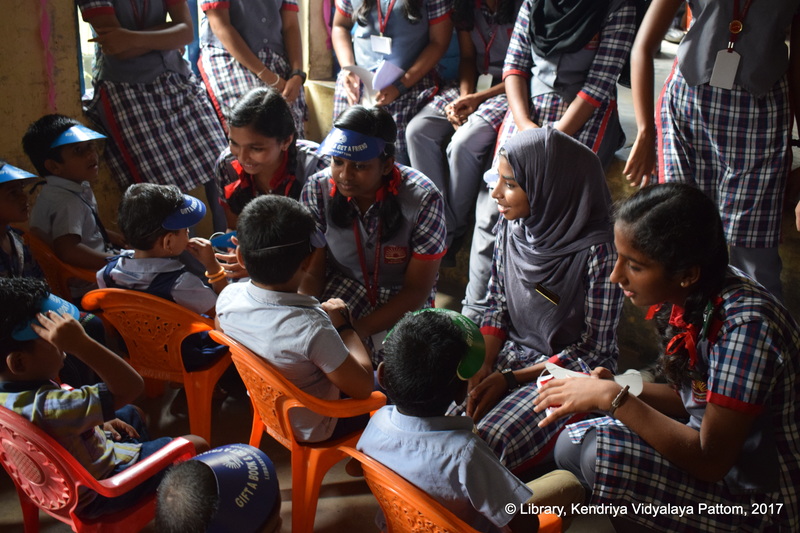 On Thursday, around 40 students of the KV Readers’ Club visited Government Upper Primary School, Ulloor, here and gifted a collection of 450 books under the Library Social Connect programme, launched last year. ‘Gift a Book, Get a Friend,’ the motto of the programme, effectively summarises why this initiative is being followed. 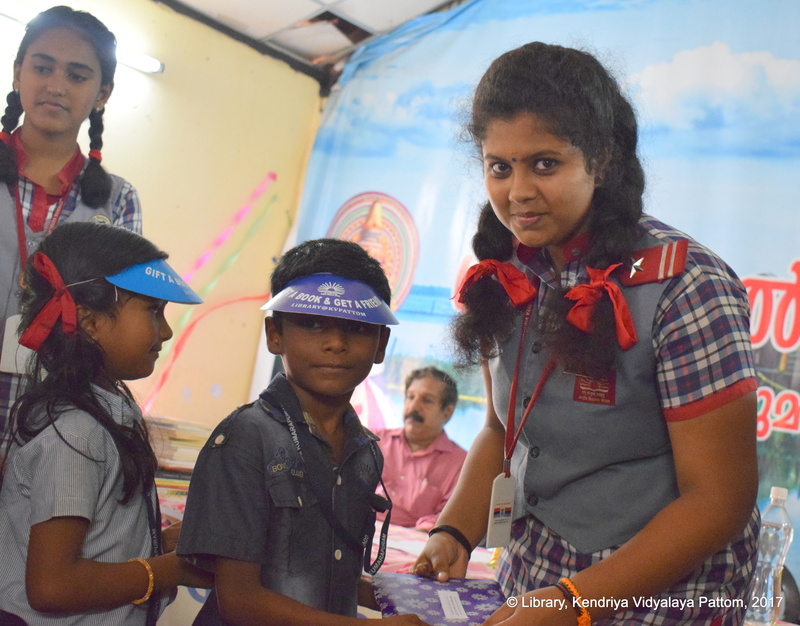 Rather than giving a financial contribution or donation, KV, Pattom, plans a long-term relationship by forging friendships through the mutual love for books. In addition to helping children in schools that lack a well-stocked library to get access to the world of literature, the programme also sensitises the Reading Club members to social reality beyond the school walls. KV, Pattom, Principal S. Ajayakumar inaugurated the function on Thursday and presented the books to his Government UPS, Ulloor, counterpart V. Dharan. After the function, the students of both schools got together to present skits, recite poems and sing songs. The KV students were then taken around the school grounds where they interacted with the students and staff of the Ulloor school. Stationery items, sweets and toys were also given to the students of Ulloor school who number only 37 — just one of the many government schools in the State that is witnessing a decline in student strength. Parent-Teacher Association president D. Prashobhithan, Mothers’ PTA president Sindhukumari and others were present. Coordinator of the event and librarian of KV, Pattom, S.L. Faisal said that the readers’ club was planning to hold more such events in the coming months. Last year, they had gifted books to Government UPS, Palkulangara. On Saturday, KV, Pattom, will observe National Library Week by organising the DEAR, Drop Everything And Read, programme when every single member of the school, as the name suggests, will abandon whatever they are preoccupied with and pick up a book or article to read. The students of Kendriya Vidyalaya Pattom gifted books to the children of Govt. U. P. S. Ulloor and made them their friends, under the social responsibility initiative “Library-Social Connect”. The programme, “Gift a Book and Get a Friend” held on the other day, was aimed to provide students with better opportunities to know about the society at large and other learning systems in particular and to make friendship through reading and books. The session was formally inaugurated by S.Ajayakumar, Principal, KV Pattom by presenting a set of books to Jose V. Dharan, Headmaster, Govt. U. P. S. Ulloor. Then the students of KV Pattom gifted books to the children of the host school. They were also presented with sweets, writing materials, cards and toys. The members of the Readers’ Club then presented songs, skit and poems to add colour to the occasion. The students together visited different corners of the school and interacted with teachers and other staff. The 450 gifted books will be added to the library collection of the school where only 37 students from less privileged sections of the society are studying. The programme was also attended by Prashobhithan D., President, PTA and Sindhukumari, President Mothers’ PTA. Distribution of uniforms to students and the inauguration of School Water and Sanitation Club were also held at the function. The library is planning more programmes under the ‘Library-Social Connect’ initiative to take the students to the society at large, informed S. L. Faisal, KV Pattom Librarian and also the coordinator of the event. 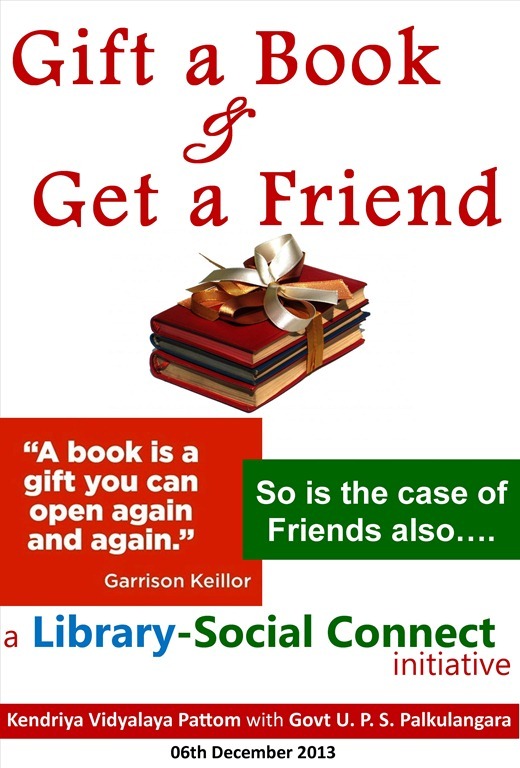 The popular Library-Social Connect Programme “Gift a Book and Get a Friend”, 2014 has been launched. Books as donations are invited from students and teachers. You may donate any book coming under children’s literature, comics, graphic novels, fiction, reference books (useful for secondary students) in good condition to the Library. The name of the school, date and time will be announced shortly. ‘Gift a Book & Get a Friend’: KV Pattom students gifted books to Govt U. P. S. Palkulangara and got friends too. The students of Kendriya Vidyalaya Pattom gifted books to the children of Govt. U. P. S. Palkulangara and make them their friends, under the newly launched social responsibility initiative “Library-Social Connect”. The programme, “Gift a Book and Get a Friend” held on the other day6th December 2013, was aimed to provide students with better opportunities to know about the society at large and other learning systems in particular and to make friendship through reading and books. The session was formally inaugurated by S. Neerada, Principal, KV Pattom by presenting a set of books to V. Anil Kumar, Head Master, Govt. U. P. S. Palkulangara, followed by each student from KV Pattom gifting books to the children of the host school. They were also gifted with sweets, writing materials, cards and toys. The members of the Readers’ Club then presented stories, book reviews, poems and played instrumental music to add colour to the occasion. Gayathri, the author of the book ‘Marunnu purattanvendi murivundakkunnavar’, shared her experience on becoming a writer. The students together visited different corners of the school and interacted with teachers and other staff. The 450 gifted books will be added to the library collection of the school where only 50 students from unprivileged sections of the society are studying. The programme was also attended by Indu, PTA Secretary and Jagadambal, former Head Mistress.